Samaritan Center – Is a private Christian weekly boarding school for boys. The program fills the needs of a physical education type program with a focus on cooperative team work, self-discipline, self-confidence, being responsible citizens for the environment all while learning the skills and tactical knowledge of sailing. Ongoing success stories include students who return to the Sailing Center after graduating and tell their story of how sailing was so important to them during their years at Sam Center. We hear every week that sailing is so popular with the boys that it is used as a reward system for cooperative behavior, good effort and positive attitude. Our instructors and volunteers develop strong personal bonds that are reinforced year after year with the students. One of the students was given a full scholarship from the Sailing Center to attend an out-of-town regatta. The scholarship included a registration fee, a sailboat, transportation of the boat to the regatta, a power boat for safety and a sailing coach. All was given to the young budding student so he could see the possibilities that are available through the sport of sailing. This program is substantially funded by private donations to the USSCMC while the school pays a small program fee. ARC of Martin County - Advocates for Rights of the Challenged (ARC) is a national non-profit organization that serves the needs of children with special needs. The USSCMC partners with ARC of Martin County’s Summer Camp to offer sailboat rides with the opportunity to learn about the wind, the waters and the boat. The success stories are all about smiles, giggles and growing self-confidence through sailing. When the children return from previous years seeing their comfort level with the activity is rewarding. Since the boats are tied to a floating dock a boat tips when children board the boat. The whole experience gives the children an opportunity to grow in in courage and confidence. This program is funded entirely by private donations to the USSCMC and is gift to the children from ARC. Hibiscus Center - Is a local non-profit center that serves the children who have been removed from their homes by the courts and were unable to be placed with a family member or a foster home. The USSCMC is proud to partner with this wonderful organization that serves these innocent children. With a curriculum designed to teach sailing the real goal for this program is to give the children a reason to smile and laugh while growing in self-confidence, courage and trust in others. Teaching sailing is the conduit to reaching into the lives of these children. Most every Sunday year round a group of sailing instructors, volunteers and a certified life-guard give the children a wonderful afternoon in sailboats. Often 3-4 sailboats with a 1:1 ratio of leaders to students ensure for a safe and special outing for the children. This program is funded entirely by private donations to the USSCMC and is gift to the children from the Hibiscus Center. Operation 300 – This local ministry was formed in memory of Aaron Vaughn, a local navy seal who was killed in action leaving behind a young family. The family who remained started a ministry to serve the children and wives of fallen heroes. Operation 300 flies the families to Stuart, Florida, where the children are treated to a camping weekend hosted by a wonderful group of veterans who serve as mentors to the children. The weekend includes, archery, fishing, horseback riding and YES…SAILING! The wives are pampered apart from the children with time at the beach, the pool and the spa. The USSCMC is honored to partner with Operation 300 and their noble mission. Approximately 4-5 times each year, 20-30 students along with a dozen or more mentors visit the US SAILING Center for a cook-out on our deck followed by an afternoon of sailing. Usually 10+ sailboats, with another 3 or more safety power boats along with skippers and safety personnel all gather together to give the children a wonderful experience of sailing. The children have the opportunity to drive the boat with a qualified skipper who maintains the safety of the boat. This program is funded entirely by private donations to the USSCMC. High School Sailing – The USSCMC is host to 6 local area schools who compete in ISSA, the Inter Scholastic Sailing Association. The program runs for most of the school year with practices 4 days a week. The Sailing Center provides sailboats, safety powerboats, classrooms, and a coaching staff to run these teams. The entry fees for this programs only cover a small portion of the real costs to run all these teams. Therefore, fundraising is a necessity for all who participate in High School Sailing. Since the High Schools reach deep into the community there is a multitude of local businesses who are proud to support High School Sailing. Stand Up For Autism – Every year the USSCMC donates its facility, boats and personnel towards this charitable fundraising event to support the families with autistic children. Keeping the Sailing Center and all the boats safe and well maintained is a prerequisite to allow events like this to take place as a donation. There is a mountain of ongoing operational expenses that are invested into keeping our facility beautiful and available to our community. Supporting the Sailing Center supports Autism, Boy Scout, Girl Scout, Veterans and many other non-profit organization. REACH Program (Middle School STEM & Sailing) - STEM stands for Science, Technology, Engineering and Math. REACH is the program developed by US SAILING to teach STEM through sailing instruction. REACH is a well-established program that is new to the USSCMC. As with all programming, it costs time, money and resources to launch a program. The Sailing Center sees a need for this age group and is excited to see it come together. Science and sailing are both expensive. We are hopeful that our science and sailing enthusiasts will offer financial support to make our program a huge success. Junior Racing Program – Optimist Prams are raced throughout the world. The USSCMC is committed to support year-round racing with quality sailboats, safety powerboats, boat trailers and all the other equipment required to make this happen. Programs like Green Fleet racing which is designed for the entry level junior racer are backed 100% by the USSCMC with the only expense for the student being fees to cover the hourly cost for coaches. This program will only continue to succeed provided the financial support is received to cover the mountain of ongoing operational expenses that keep our facility and boats available to our community. Project L.I.F.T. is a non-profit that serves teens at risk. Through vocational training and “play therapy”, Project L.I.F.T. therapists teach teens how to replace negative behaviors and addictions with healthy and productive lifestyles. The USSCMC is proud to collaborate with Project L.I.F.T by offering sailing as a healthy habit that serves as a recreational outlet stimulating exercise of the mind, body and spirit. This sailing program is funded entirely by private donations and grants to the USSCMC. It is intended to be a life changing gift to the teens who are enrolled at Project L.I.F.T. Additional organizations include Sea Scouts, Boy Scouts, Girl Scouts, Veterans, and local organizations who seek donations from us to assist in their fundraising and community outreach. 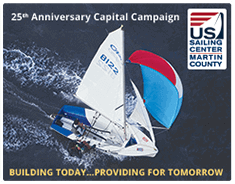 The USSCMC is constantly striving to create affordable programs and build partnerships to ensure sailing is, and will continue to be, accessible to all.